Summary: Error message such as “You need to format disk in Drive before you can use it” is kind of annoying problem when you plug the external disk or USB pen drive with the computer. It disables you to access the files in your drive, however, never hit Format Disk. 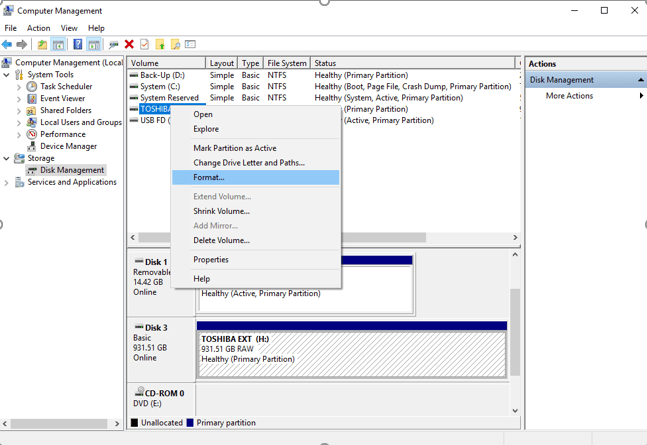 This article will provide you with massive reasons into why not and best solutions on how to fix external hard drive asking to format error without losing data. The external hard drive is a device with portable storage with relatively high capacities, can be plugged into your computer or thru FireWire for wireless connection. It is often used to back up especially large size files. Like any other removable device e.g. USB flash drive, pen drive and SD card, external hard drive when usually forcedly unplugged from the computer without using Safely Remove Option causes the device being corrupted and unreadable or disk management displays file system as RAW. A simple reminder: Upon unplugging your external hard drive using Safely Remove Option, a warning message will pop up “This device is currently in use. Close any programs or windows that might be using the device and then try again”, do it and once done restart your computer. Please don’t be anxious when you receive this error message. With no second thoughts, formatting your drive should never be your first solution. Never risk the important files in your external hard drive by proceeding to format procedure. If you do, you will see zero files in your external hard drive and that should not happen. The smart choice is to recover your data first with Bitwar Data Recovery. Later, fix the device by formatting as your last resort when other options won’t work. Now, here are the options we are talking about that you can try. Simply follow these easy methods provided for you. Sometimes, the blame is on the USB port. You can try all the available USB ports on your computer because it might be corrupted. Check if the error message appears, if yes, proceed to next. Reboot your computer and plug in your external hard drive again. Your PC might have experience malfunctions. If the error message persists, go on to the next. Let us just verify if your computer is the real villain. If your external hard drive is functioning, then fix your computer. As mentioned above, the real culprit might be virus attacks. Run anti-virus software to scan the drive. Kill the virus once detected and retry to plug in your drive. If the error message still pops up, go to the next method. Take note of the drive letter in the error e.g. “You need to format the disk in drive H: before you can use it, do you want to format it”. Your external hard drive letter is H. Right click on the Start Menu and select Command Prompt or type “cmd” and hit Enter to run it as administrator. In the popup command window, type “chkdsk drive letter:f”, since your drive letter is “H”, then simply type “chkdsk H:f” and hit Enter. The windows will start repairing errors and damaged files. After that, try to plug in your external hard drive, consider restarting your PC. If you encounter the message “the type of the file system is RAW, CHKDSK is not available for RAW drives,” we’ll move on to the promising solution – recover your data. Step 1. Just download and install the Bitwar Data Recovery by in Windows or for Mac. Then click Launch. Step 2. Launch the software and select the external hard drive to recover your files and go Next. Step 3. Choose the scan mode and select the file(s) you wish to recover. Click Next. Step 4. The scanning percentage will appear in the software window including the estimated time remaining. There is also an option where you can click the pause or stop button and preview while scanning when the files you wish to recover are shown in the software window. Select the file(s) you need and hit Recover, a window message will appear, click OK.
Save your recovered files to another safe partition in your PC or other external storage devices, window message will pop up confirming that you have successfully recovered your selected files. Now that you have safely saved your recovered data to another location, you may proceed to the formatting process when options provided did not work out. Step 1. After plugging in your external hard drive to your PC, go to My Computer right click and press Manage and proceed to Disk Management. Step 2. Right Click your External Hard Drive and select “Format”. Step 3. Choose the file system that suits your drive: NTFS/exFat. Type the new name of your external hard drive in the partition label. Then proceed to format procedure. Your external hard drive just completely finished formatting procedure and ready to be used again! The very core of this article is to emphasize that it is not recommended to format your disk right away when You need to format disk in Drive before you can use it error appears. Eventually, you will lose your data if you do. Always make sure you have backups. Moreover, consider other options provided to you and have hopes that one will work out. Nevertheless, as amazing as it is, Bitwar Data Recovery has the power to restore your data in your unformatted external hard drive and this recovery software has so much more to offer. Download Bitwar Data Recovery and learn more about it to address your issues when need arises! No problems following the steps to use Bitwar, the formatting went great too. Thank you for the article and the software, good quality team and work! Congrats! You are welcome, Austin, if you need our assistance, please don’t hesitate to let us know. Have a nice day! Hi, Thanks for your comment, Kiara and in the meantime, we are happy to see that the article could do to help with your issue, have a nice day! YESSSS! I though all my files were going to be deleted!!!! Thank you thank you thank you!!! Fast download, software runs perfectly! It shows you to see and select anything you want to recover, perfectly solution 100 % recommended. Yes, Ashley, that’s quite an unignored issue that most of the users click on Yes to format the disk without considering the data will be lost. Anyway, we still suggest that don’t do it! As our data recovery software can do to help recover the data from your external device. Then the right step of getting away the system prompt is to recover the data first and then format the device. However, I am happy that you can retrieve your data with our solution. Have a nice day. It is very common problem for people like me who take their work to different computers though their usb, and the worst is just not being able to recover the files , very happy that I found this, I tested it few hours ago and worked perfectly! Thanks for your review, Andrew, we are glad to be your assistant anytime you are having troubles while using the software. Have a nice day. Great! Thank you so much for the quality info and the help, also fast reply! I donwloaded the software and I’m n love with Bitwar so far I’ve use it a couple of times, and also helped a friend with it!!! Nice day to u too! Thanks for your recommendation, and we are always here to help if you need any support from us. Have a nice day! Oh Wow, didn’t knew the “safely remove option” was that important, thank you really good information, will be more careful for now on. Followed the steps exactly as described, I think this guide made it like an easy process, so thanks! Got the chance to backup all my files, but I will definitely will look into this Bitwar software, looks really great! Yes, Carlisle, make sure every time if you want to plug off no matter the external hard drive, USB flash drive or SD memory card, close everything that is opened from your external devices, such as documents, photos or programs, and then safely removed the device from Windows, after that, plug the device out from the USB port. Thanks again for your comment, and have a nice day!